High Resolution from 2 megapixels, 5 megapixels or more. Get affordable Security Camera installation on Alhambra, CA and CCTV equipment with commercial quality and 2 years warranty. The common DVR technology offers the following number of input for cameras: 4, 8, 16, 24, 32, 64, 128, and 256 channels. If you need 1 to 4 cameras, you’ll need 4 channels DVR. From 5 to 8 cameras you’ll need 8 channels DVR, and so on. To have the right security camera DVR is critical. Have a DVR with more channels than security cameras installed in the beginning; give us flexibility to add more cameras in the future. Security cameras is just one line of defense against crime, combine security cameras with other measures, such as a burglar alarm, lights, and dogs, will give you the best protection against burglars. Protection4less supply security cameras across La County & Orange County. Our range includes: TVI & IP security camera systems. We have outdoor and indoor cameras with different shapes and resolutions. 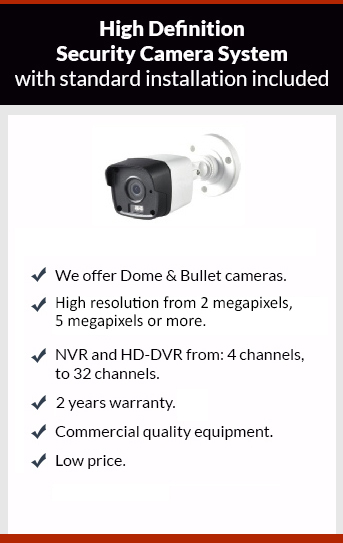 Just give us call to get your security camera system at the best price & quality.